Galactic Con 2015 is over. It’s been two weeks, and I am just about done with thank yous and follow ups. It was an amazing turn out… obviously more than our venue could handle. We are already planning on a bigger venue for 2016, but I will post more on that later. 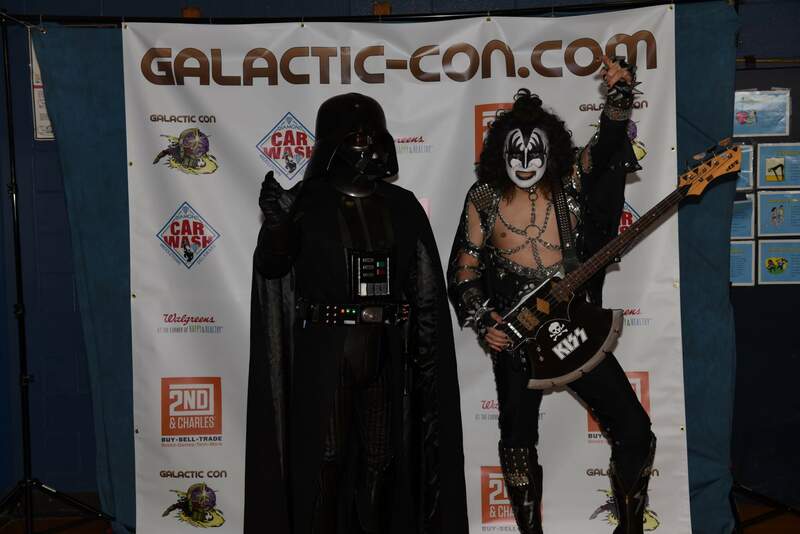 Galactic Con really was a “mom-and-pop” convention, (although my daughter has never called me “pop”) considering it was almost entirely planned and organized by my wife and I. Way back in July we had the idea that we could host a comic-con in Middletown, make it affordable for families, get a few artists and vendors to show up and have a good time. My father-in-law had worked for Diamond Comics for years and provided valuable advice (along with 1000 bags and free comic books after our initial 500 ran out). We had visited a few small comic-cons, comic book shows, and toys shows in the area, so we did expect about 500 people. We also thought we might be able to find a dozen artists and a handful of vendors. At one point, we were planning to use half of the gym as an event area, with crafts for kids, and even a “Blast the Trooper” event with the 501st. By December, those plans were scrapped and we had already begun collecting names for our wait-list. We flat out denied any vendors who had hoped to sell home repairs, cruises, health products, and the like, but we had made that decision long ago. While we could not fill the gym with comic book vendors only (and we tried to get everyone in the area), we only wanted comics, toys, pop culture and cosplay. How did we end up with over 2,000 people, and a seemingly endless line? People wanted this in our town, and people wanted to be there. We had support from many local shops who helped promote us with flyers and signage. Westown Movies was our featured sponsor. If you saw our ad there, then you already know how wonderful the theater is. If you have not been to Westown, you should really make some plans… maybe in May. As the event got closer, we also began to get a lot of local media coverage. This was around the same time my wife began having nightmares, as noted in the article. We had family and friends coming in to help us sell tickets and man our vendor space. However, I still had the idea that I would be able to run the Charity Raffle, help with admissions, work my booth and maybe even shop a little. That did not happen. My wife and I were glued to the front door. We had a steady supply of family members stepping in to help out, so that we could eat, drink and go to the bathroom. I am pretty sure there are at least a few people still waiting for me to get back to them with answers. We have a survey available, and one of the most popular suggestions, right behind “get more space,” was to have more people at the ticket table to move the line faster. Unfortunately, more people would not have made the difference. Around noon, our school custodian informed us that we could not let any more people in until a group of people left. We were at fire code, maybe we already broke it, but the fact of the matter was we were not able to sell tickets faster… there would have been nowhere to go. BUT, we did it! We had an enormous success, and it seems like everyone is ready to come back again next year… as long as we can find a bigger place. We found a bigger place and in 2017, MTown Sports is building an even bigger place. Stick with us and we will get better every year!